Congratulations to Abbi Crutchfield and Andrew Singer on the 1-year anniversary of their show, Positively Awesome. 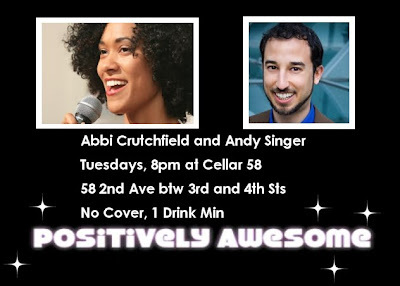 For the past year, Abbi and Andy have hosted a weekly comedy night at the east village wine bar Cellar 58. Every Tuesday, they present some of NYC’s top comic talent and cap off the night with the freestyle hip-hop stylings of soce, the elemental wizard. They recommend “a glass of bubbly to compliment the effervescent comedy in this intimate wine cellar”. Plus, patrons get a 10% discount on all food and drink purchased after each show.